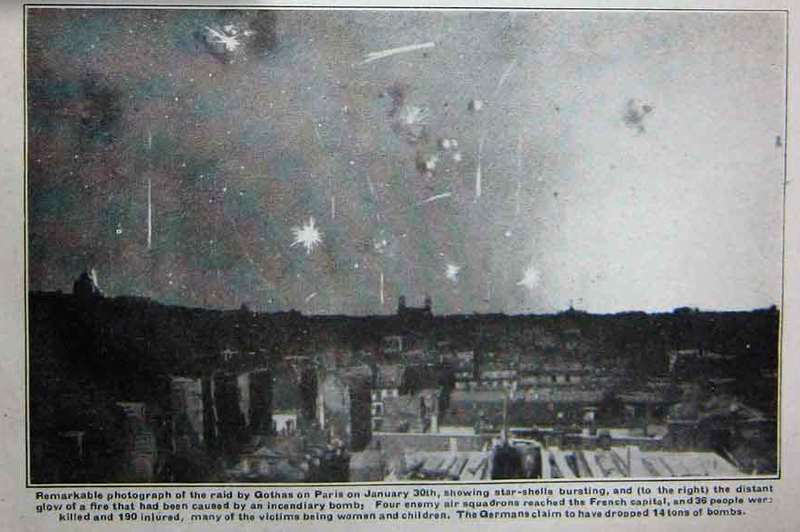 While the First World War did not see such a devastating attack on the city, there were repeated bombardments. Paris was, after all, closer to the front than any of the other belligerent capitals. 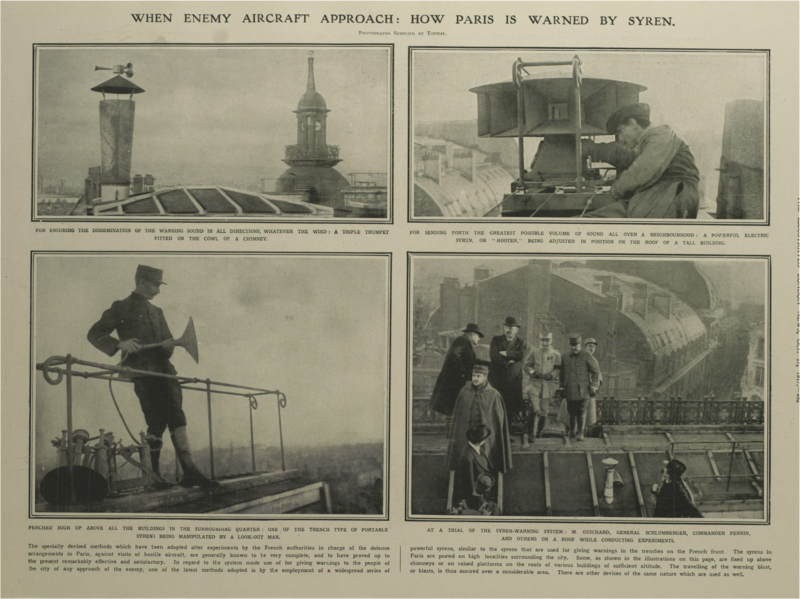 Historian Susan Grayzel provides a careful chronology of air raids on Paris in ‘The souls of soldiers”: civilians under fire in First World War France’ (Journal of modern history 78 (2006) 588-622), and it’s clear that the major bursts of activity were at the beginning and the end of the war: August-October 1914 and a crescendo between January-September 1918. 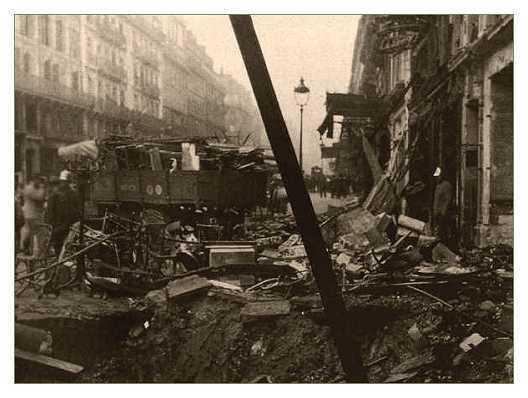 All told, Grayzel’s tabulations (from Jules Poirier’s Bombardements de Paris) show that attacks from German aircraft killed 275 people and injured 610 in the city and in the banlieu. 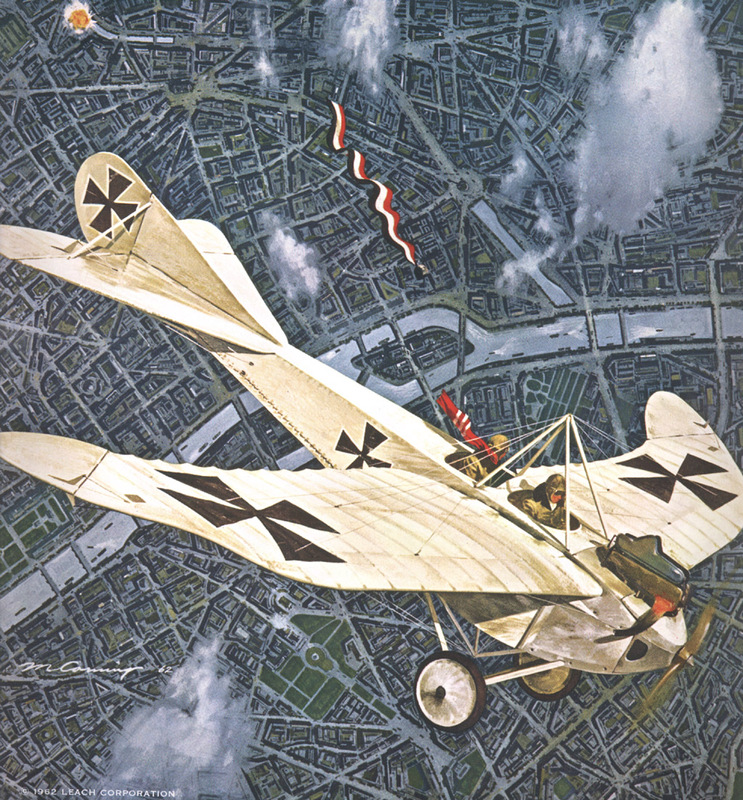 On 30 August 1914 a two-seater German Taube (‘Dove’) aircraft circled in the sky over Paris, and at 12.45 p.m. began to drop the first of four 5lb. bombs. The final ‘bomb’ was a sack of sand with a message attached: ‘The German Army is at your gates. You can do nothing but surrender.’ This was the first propaganda drop in aviation history and, like most subsequent leafleting raids, had little effect. “I was awakened by firemen’s bugles, and as we had all been warned I had no doubt what the noise meant. I dressed and hesitated whether to leave my flat on the top story, but decided to stay and see what was going to happen. I watched the police trying to extinguish a gas jet in the road below, which gave them a great deal of trouble. Then for a long time nothing happened. The night was so clear and peaceful, it seemed impossible that there could be any danger. “Suddenly there came reports from distant guns, and then a series of vivid flashes from behind houses at no great distance, followed by a violent cannonade which made the windows rattle. “Searchlights were playing in all directions, but at first nothing was visible except the ghostly outline of the Eiffel Tower. Then I noticed that several stars were obscured by what seemed to be a long grey cloud moving at a tremendous rate. It seemed more like a shadow than anything solid. What struck me most about it was its enormous length and extraordinary speed. When a searchlight fell on it, it was only a fraction of a second before it passed out of its field. I knew at once it was a Zeppelin. As we had been forbidden to show any light, I lit a match in a corner of the room, and looked at my watch. It was ten minutes to two. 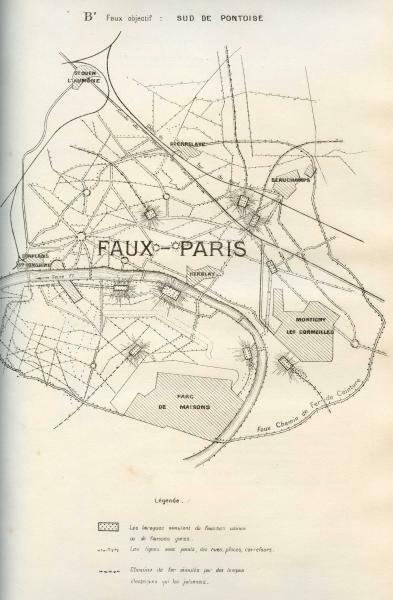 As Grayzel shows, contemporary reports were part of an elaborate construction of Paris as an ‘innocent, heroic, feminized city’, and the phallic Zeppelin was turned into a faux, puffed-up masculinity that was contrasted with the ‘real’ masculinity (and by extension the ‘real’ war) of ‘hand-to-hand combat with bayonets’. The blackout was reintroduced, but it was only partially effective. The Associated Press reported on 22 March that 1500 prosecutions for violations of the new restrictions had been launched in just two days in an attempt to produce a ‘darker Paris’. But the offenders were not confined to a careless public. Firemen’s bugles were no longer adequate to warn the public and new air raid sirens were installed – a sufficient novelty to spark a feature in the Illustrated London News (below): since July 1917 Britain had relied on a system of marine distress maroons to warn of approaching enemy aircraft, supplemented by Boy Scouts with bugles and policemen with placards and whistles – and Parisians now regularly took shelter in cellars or in public shelters (there were 5,000 of them). 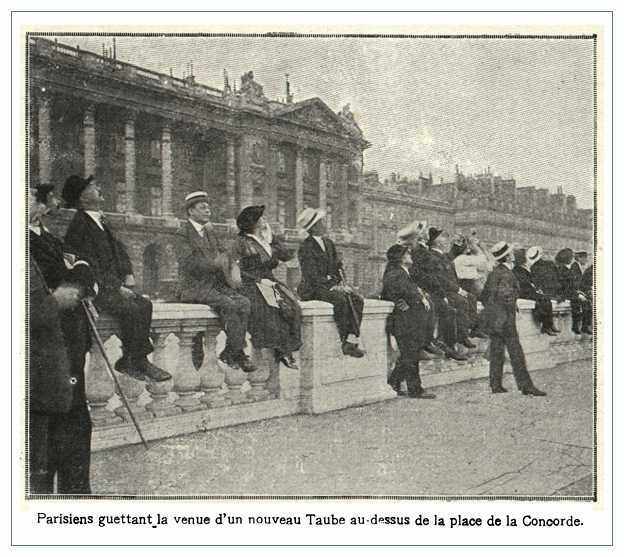 ‘Paris was out en fête to receive the Gothas this morning… Last night there was considerable excitement following the alarm, but this morning there was more of a picnic spirit. As I write, at 10.30 at the Matin office, there is an explosion as of a bomb around the corner. Through the open window I see people on the roofs across the boulevard scanning the cloudless Springlike skies. At the Ritz and other hotels many guests assembled downstairs but there was not the slightest panic. I walked through the Rue de la Paix with Ridgely Carter and found the Place de l’Opéra crowded, everybody looking up as if watching some astronomical phenomenon. Many taxis were standing in rank in the Boulevard des Italiens but the chauffeurs had all left them to join the gazer sin the square. The date was auspicious. 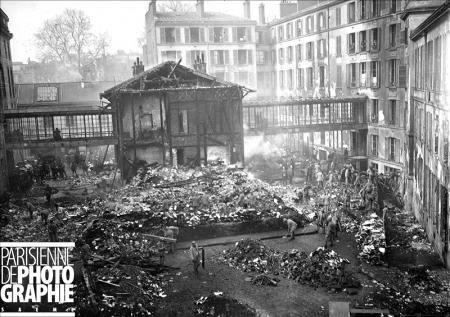 The explosion that morning in the Place de la République seemed (im)perfectly ordinary, and the DCA assumed that the city had suffered another air raid. 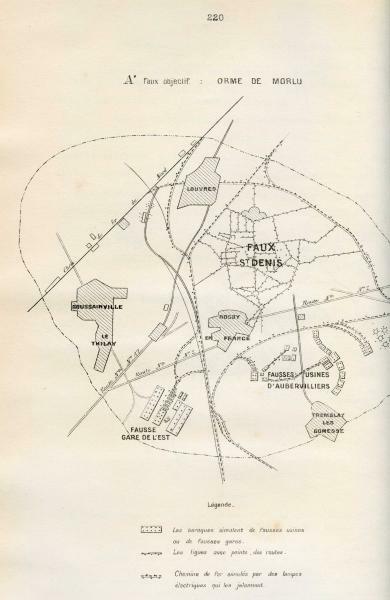 But by the end of the day, as explosions continued at regular intervals and 16 people lay dead, it became clear that Paris was under artillery fire. The DCA plotted the trajectory of fire from the locations of the first explosions, and sent aircraft to find the source. 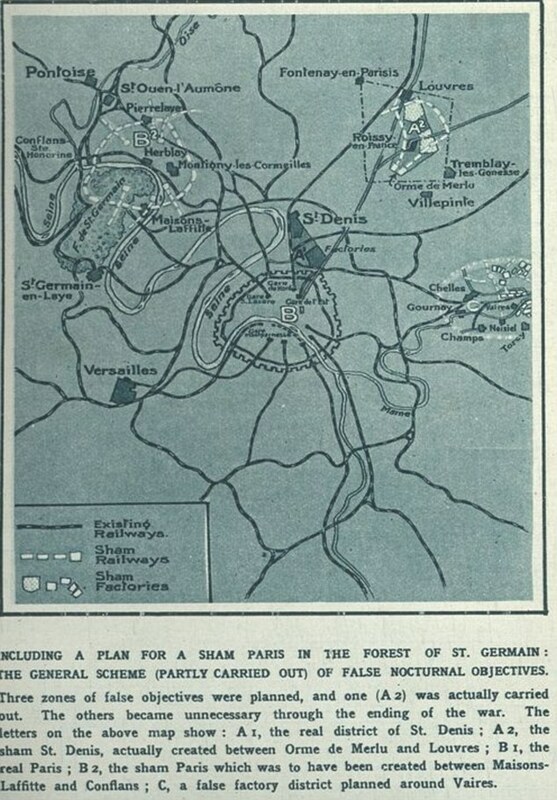 The battery was hidden in the forest of Courcy, an unimaginable 120 kilometres away, and Krupp’s long-range siege gun continued to shell the city until August, scattering some 20 shells across Paris each day. This new ‘fire on Paris’ killed 250 people and caused widespread damage, but had little effect on everyday life in the city. I was in Paris during the first days of the bombardment, and I know something about the morale of the city under circumstances of acute unpleasantness. Air raids are horrible enough but they have their time limit. There is no “all clear” in an attack by the mystery gun. I remember that on Good Friday it began early in the morning, and the explosions continued throughout the day, occurring precisely at every quarter of an hour. That is a form of irritation which the Huns thought would empty Paris in a week. Some people left the city as some people have left London to escape the raid. But the greater number of Parisians went quietly about their work and did not even leave the business at hand to seek shelter from the approach of the next expected attack. Paris is so close to the war and has lived for so long beneath its shadow that it would take more than a long range-gun to disturb the normal course of its way of living. Ironically, at the start of the war the French high command – like the other belligerents – had believed that the primary role of its own air force would be reconnaissance, and aircraft were soon soon providing crucial intelligence to range field guns on the battlefield. 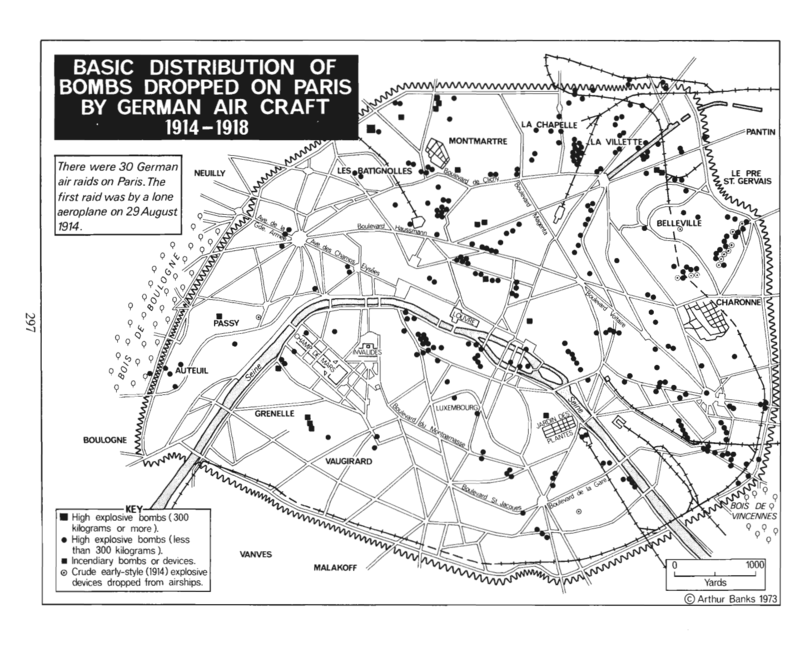 Even when the French turned to tactical and strategic bombing, air power remained, as General Pétain insisted, ‘the direct extension of artillery’, so that all efforts had to ‘converge on the essential act: the battle’. The danger was more imminent and more substantial than the DCA could have known. 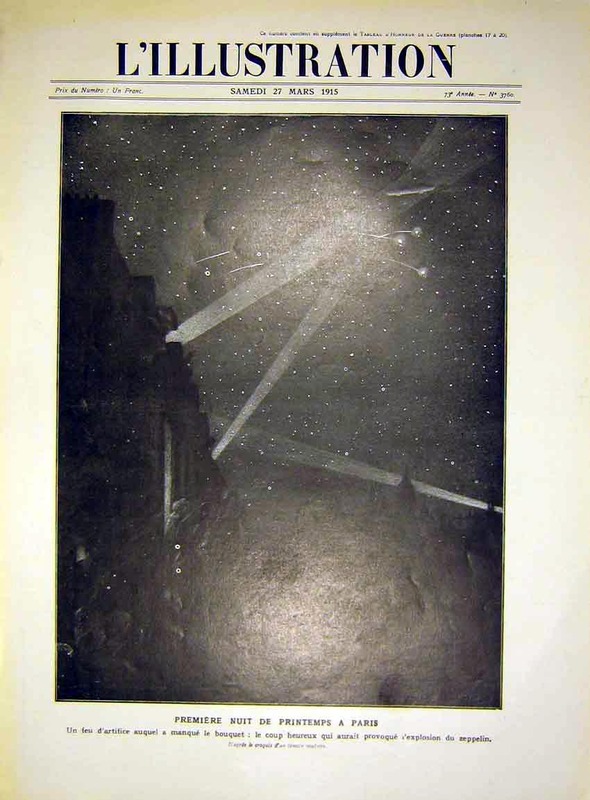 On the night of 23 September 1918 the last of 20,000 new, deadly incendiary bombs – ‘Elektrons’ – were being loaded on to 45 heavy Giant bombers for a devastating raid on Paris. The plan, according to Neil Hanson in First Blitz (Doubleday, 2008), pp. 330-333, was to create an immense firestorm. Some of the pilots had already completed their final checks before starting their engines. Suddenly a staff car raced across the airfield with orders from Ludendorff abruptly cancelling the mission. Whether this was the result of a fear of the reprisal raids that such a spectacular attack would provoke (a simultaneous raid was to be launched against London – the focus of Hanson’s book) or whether the high command had already realised they would have to sue for peace is unclear. What is certain is that Paris was saved at an eleventh hour 18 days before the final eleventh hour of the Armistice. Postscript: Faux Paris remained largely a paper city, but in the not too distant future quite other ‘towns to be bombed’ would be built. After the bombing of Coventry in 1940 Britain created a number of bombing decoys – known as Starfish sites (from SF: ‘Special Fires’) – to lure the Luftwaffe away from towns and other strategic locations. The first was on Black Down in Somerset’s Mendip Hills, where Shepperton Film Studios created a fake Bristol (of sorts), including ‘glow boxes’ designed to simulate the streets and marshalling yards and creosote and water ‘fires’ to simulate incendiary bombs. It was part of a dispersed system of sites standing for other parts of the city – for example, the docks and marshalling yards at Canon’s Marsh were reproduced at Burrington close by. For an RAF photograph of the Black Down site at night see here. 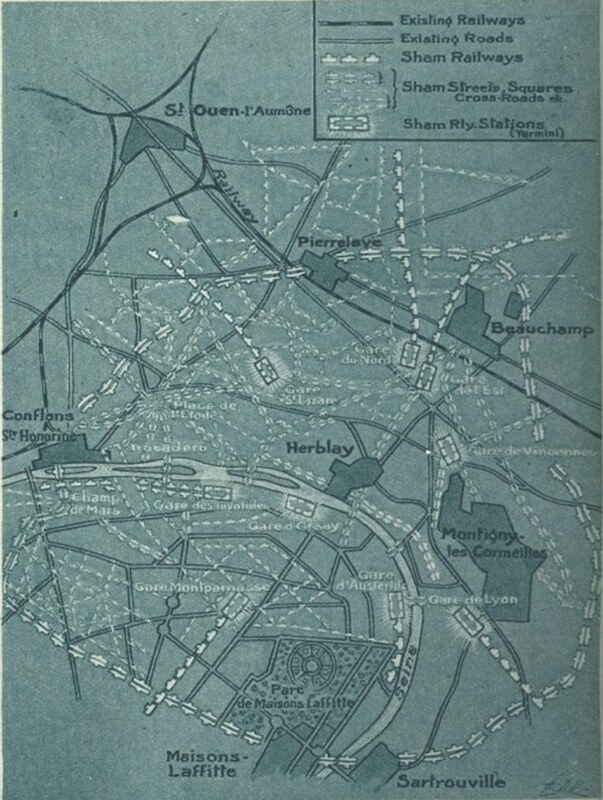 By the end of the war there were over 200 sites protecting 80-odd locations, including London and Manchester. 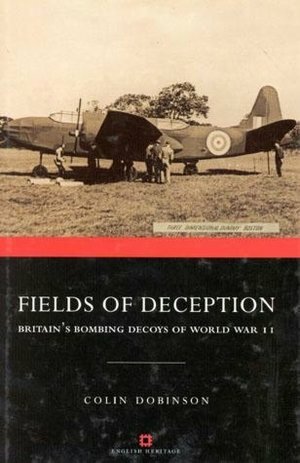 More here, and much more information in Colin Dobinson, Fields of deception: Britain’s bombing decoys of World War II (Methuen, 2000; a new edition is advertised for 2013). All of this intersects with a rich literature on camouflage – and in geography (and anywhere else, for that matter) I’m thinking of Isla Forsyth‘s marvellous work – but we should remember that other fake towns were built during the Second World War for entirely the reverse purpose: for experimenting with fire-bombing and, ultimately, for testing the atomic bomb. 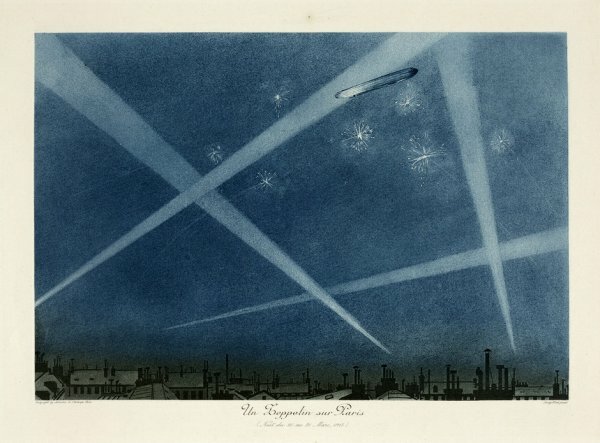 This entry was posted in air wars, bombing, World War I and tagged 'Big Bertha', Gotha bombers, Zeppelins by Derek Gregory. Bookmark the permalink. Is there any chance you could let me have the source of the image above showing the DCA Staff looking at a large map display or a good scan so that the captions can be read. 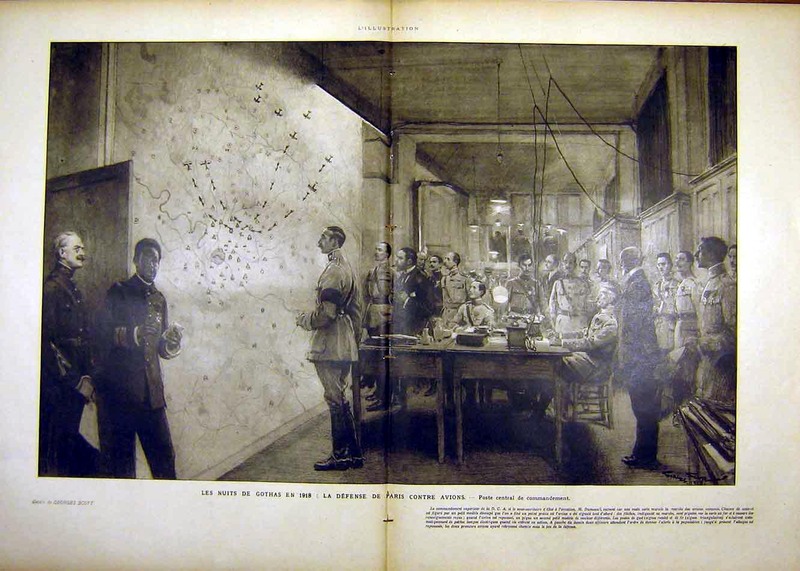 I am currently researching for the RAF WWI air defence systems.